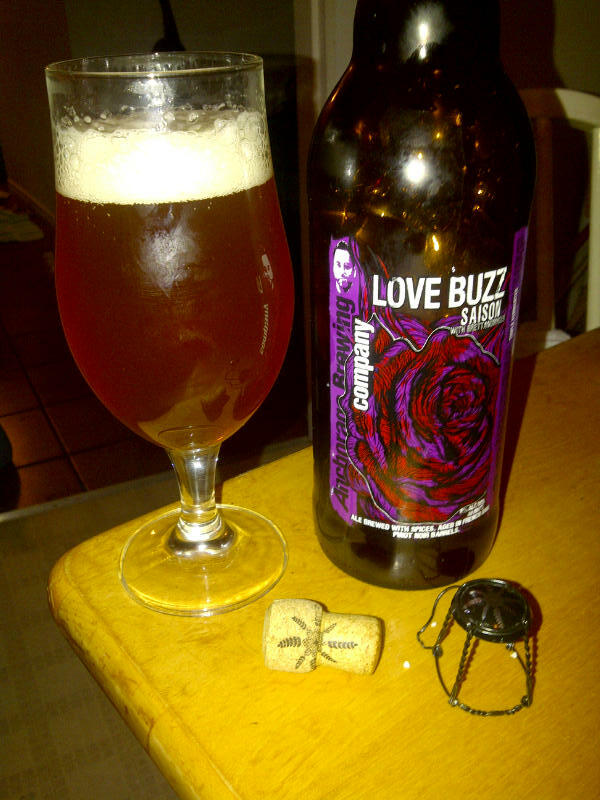 From Anchorage Alaska’s Anchorage Brewing Company comes their “Love Buzz Saison”. This brew is both aged in French oak wine tanks and bottle fermented with the wild yeast Brettanomyces giving it a very distinct character. This saison is brewed with Hobbs Family rose hips. This beer pours a very cloudy light amber colour with an off white head. The aroma is fruity, sweet with hints of funk from the Brettanomyces yeast and some oak. The flavour is huge with a sweet wine hint up front from the wine barrel aging followed by lots of fruity notes including orange peel and pineapple. This is followed by a nice tart funk brought on by the Brett as well as a nice pepperiness and a mild hops bitterness to round everything out. The alcohol content of this saison is 8% with and IBU of 40. I am in love with this beer and only wish that it was available in Canada so I could save all the hassle of ordering in the states and having to pick it up from a parcel place down there. Commercial Description: A feeling overcomes, deriving of a most curious perplexity. A rich desire awakens to explore the contents of such delicate loveliness. Upon a deep connection with rounded lips, a bitter sweet complexity enters the soul…and so begins an amorous affair. Heightened awareness envelopes the senses as the grandeur of such bold character develops. Caramel beauty exhibits itself, sprawling its full body widely upward, bubbling with excitement. Tantalizing effects of peppery bitterness grasps the tongue. Enchantment takes hold as a blanket of citrus slowly unfolds. As in any noteworthy love story, a subtle fruity sweetness of a rose emerges to the finish. A warm contentment grazes over, signifying a united marriage of balance and pleasure. Fortitude has revealed itself to those who have encountered such an enriching experience. An experience so delectable, so defining, so unequivocal. An experience that is Love’s Buzz. This entry was posted in Barrel Aged, Imperial, Saison and tagged alaska, anchorage, Anchorage Brewing Company, barrel aged, beer, brettanomyces, Brettanomyces yeast, fruit, fruity, funk, hops, hopy, imperial, mild hops, orange peel, pepper, pepperiness, pineapple, saison, tart, usa, wine, wine barrel aged.